Kitwe District Commissioner Chanda Kabwe has asked the police in the district to arrest anyone wearing military regalia. Mr. Kabwe says he has observed with concern a growing trend of people from a named opposition political party wearing military regalia. He said criminals in Kitwe are taking advantage of this situation and are terrorizing residents using the military uniforms. Mr. Kabwe said it is against the law for civilians to wear military uniform and has appealed to those doing so to stop. He said those wearing military regalia are instilling fear in residents especially marketeers who are complaining of being intimidated by the same people. Mr. Kabwe was speaking in a walk in interview with ZNBC News in Kitwe. But iwe chikamba, YOU harbour so much hatred for Chishimba!! ….imagine someone describing your papa or mama the way you done to someone’s father and husband..? ?..grow up man..
imagine someones daughter or mother being stripped in public or a brother, father ,friend being hacked just for having divergent views and the powers that be selectively ignoring those things.utter hypocrisy, Jesus should come fast and rid society of mongrels that have got means to stop this carnage i will call an angel and angel according to deeds and a orangutan and orangutan. Kwati cipushi tabatekele bwino mu garden and from which global planet do you find this kind of gorrilas? The only party that has murdered people is PF using police, military regalia, pangas and machetes. Evidence: PF cadres have been prosecuted and sentenced for murder in courts of law and currently serving sentence with hard labour. Kambwili is ugly, you are right makwingo. He will make my kids cry. He is busy gaining weight while ordinary citizens Look malnourished. That big head is full of water no brains at all, spokesman who can’t articulate things in a professional manner. …spokesman who can’t articulate things in a professional manner…. And the clown Lungu appoints him “Chief Government Spokesman” …. !!!! Do we really need any more PROOF just how incompetent and dull the visionless drunkard is? 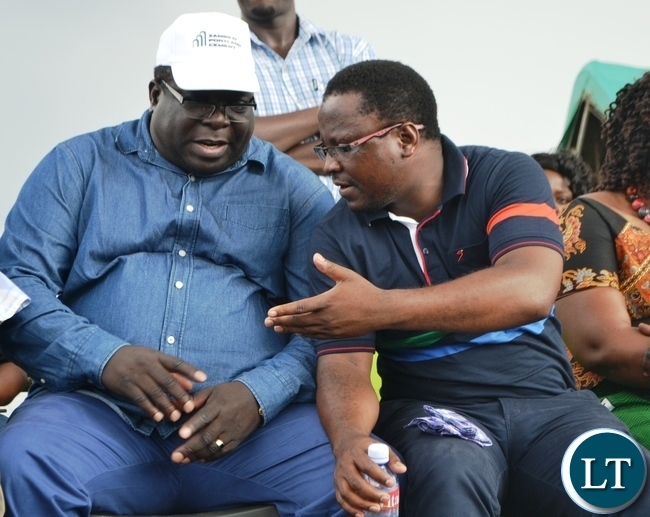 Did you know that Kambwili is laughing at GBM, that he (GBM)is ugly? Kwati cipushi tabatekele bwino mu garden and from what global planet do you find this kind of gorrilas. Jerabos should continue to sort out ba up and down on the copperbelt.Let them continue campaigning in their so called monze and see if they will win in August. Coward, sending your friends to do your dreams. The Jarebos gang have no balls to carry out any feasible stunts on the CB. Soon they will be extinct come August 12. Mostly Nonsense comments so far, can’t join in. How can Chanda say a known party when his party the PF were seen in the media guarding GBM s gym wearing military fatigue with a PF beret. Chanda if you have nothing to say, please keep quiet rather than exposing your ignorance. Sata is the worst thing that ever happened to Zambia.How did he mange to surround himself with so many id0ts?Even the educated ons are pathetic,look at Nkandu Luo,Simbyakula,Kabimba John Phiri etc.How did Sata manage to find such *****s and surround himself with them? If a self confessed lawyer can’t follow this law whatmo those pf hoodlums, there a lot of pictures of him on social media putting on a baret and saluting and another one of him in a coumoflage cap written pf in front, this ka stone chanda has a memory of a chicken, let me remind that he has promised marketeers loans, upto now there is nothing, now we have heard that instead of the promised cash loans people are now been given bicycle loans, where is the cash for the marketeers? Imwe leave Kambwili alone with his looks. God was very busy and tired when he made him. At least he is still in Gods image!